Actor Ernest Borgnine, who spoke out against the 2005 gay cowboy romance Brokeback Mountain, will be honored with a lifetime achievement award from the Screen Actors Guild award, reports Los Angeles Times blog The Gold Derby. 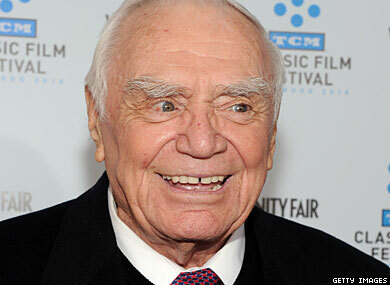 "I didn’t see it and I don’t care to see it,” Borgnine told Entertainment Weekly. “I know they say it’s a good picture, but I don’t care to see it. If John Wayne were alive, he’d be rolling over in his grave!" Brokeback Mountain was considered a front-runner to win the Academy Award for best picture of 2005 but lost in a surprising upset to Crash. Many attribute the loss to homophobia within the film industry. Borgnine won an Academy Award as best actor for 1955’s Marty and was famously married to the late Broadway legend and gay icon Ethel Merman for a mere 32 days in 1964. The Screen Actors Guild awards are scheduled to be presented January 30.